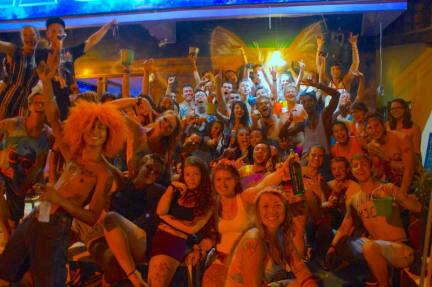 Do you love parties, hanging out with other backpackers, playing drinking games and having fun? Then the spaceship is for you! We are the shiniest star in the Koh Phangan night sky! Our spaceship is well renowned for its legendary pre-parties and is fully equipped with great speakers, the freshest music and the cheapest hostel bar in the area for all your needs before you're heading to one of the island's world famous parties - many of them located nearby and therefore just a quick taxi ride away. Join the fun and get 'Free shots and free body paint & glitter' during the pre-parties! Don't miss the beer pong tournament and win $$$ or party tickets or both! Full moon-Info: To get the full experience of all the big parties before Full moon and make the most out of your time on the island, we recommend that you arrive at least 3 days before the day of the Full moon Party. ***Update*** A foosball table has arrived at the spaceship! Come and challenge your friends in a tournament or just for fun! We have super comfortable beds for a pleasant sleep. The 4-bed dorms have extra large beds. All beds have individual power sockets. All our dorms are equipped with powerful adjustable 24h Air Cons and all 4-bed dorms and the 8-bed dorm have en suite bathrooms with hot showers (the 12-bed dorm has access to 3 shared bathrooms with hot showers). We provide blankets and towels. All dorms, bathrooms and the common area are cleaned daily. There are lockers inside every dorm for your valuables. Our WIFI is lightning-fast (100 mbps optical fiber connection - one of the fastest on the island!)! We know how important it is for you to share all your travel experiences with your friends or stream videos on hangover days. Outside of the busy Full moon or Half moon days, Koh Phangan is a lot more chilled. There are still plenty of great parties to choose from but the hostel vibe will be adjusted to whatever the guests choose - Party? If you're in the mood we deliver! Movie night? No problem! Or just a relaxed atmosphere at the bar. We listen to what our guests want :-). We offer trips around the island, scooter rental (no rip-offs) and tours and of course can also arrange all the other amazing activities here for you: diving, snorkelling, stand up paddle, jungle hiking, trips to remote beaches, kayaking, water parks and much more. We are located centrally in Baan Tai . A 7-minute taxi ride from the main pier in Thong Sala. Nearby parties include: Half moon Festival, Jungle Experience, Waterfall Party, Black moon Culture, Loi Lay floating party and more. You can easily access Baan Tai beach: Just walk 2 minutes down from the garden and you're ready to relax in the sun or chill in the beach bar. A 24-hour convenience store, ATMs, restaurants, laundry service, massage places and shops are just next door. PLUS our hostel taxi is a 4x4 offroad truck which is able to take you on an adventurous jungle ride to the super remote underground parties on the east coast of the island, with no road access: Eden Garden, Guy's Bar, Lost Paradise and Peace & Love bar. If you love underground techno music and are looking for a very special party experience outside of the busy Full Moon period you should definitely not miss out on these!! 1. We are a social party place. If you like to be on you own and don't enjoy hanging out with fellow backpackers, you might be better off staying in a different type of accommodation. 2. Your booking must be paid in cash (Thai Baht) upon check-in.Fullmoon and New Year Party bookings must be paid in advance via PayPal invoice. 3. Check-in from 11 am and check-out until 12 pm. 4. Our reception opens at 9 am. If you need assistance earlier, please notify us at least 24 hours in advance. 5. Cancellation policy: If you wish to cancel your booking, you must to do so at least 48 hours in advance. All Bookings for Full moon and New Year periods must be paid in full in advance via PayPal invoice (no account needed - you can pay with any credit card). Once you make the booking, you will receive your invoice from us. Your booking is not secure until the remaining balance of your booking is paid to us. All Full moon Bookings must cancel 5 days before 12:00 PM of your date of arrival in order to receive a full refund. All New Year Bookings must cancel 10 days before 12:00 PM of your date of arrival in order to receive a full refund. Had a fantastic stay at Cats In Space! The staff is incredibly friendly and they go out of their way to organise daytime activities and get the party started at night! During my stay many people from other hostels came over to Cats In Space just to party, and for good reasons. Joe, Champ: thanks a lot for an awesome Half Moon! I had such a Nice time at cats in space hostel. The owners Julia and champ really make sure you have a great time! If you like meeting great people to chill and party with this is the perfect hostel for you! Would definitely stay again! Best time ever. The staff is amazing and soo friendly. They even start the pregaming themselves and they go to all the parties too. Dont bother staying here if you dont want to party because this hostel is very noisey and alcohol is everywhere. 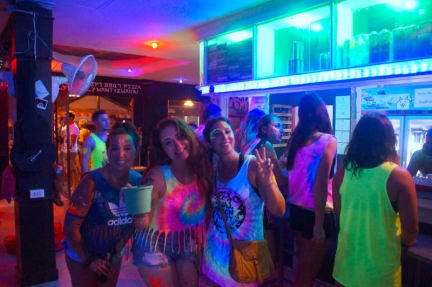 However, if you're going to the full moon party and you want to experience the whole preparty atmosphere, this hostel is the place to go! Oh and the hostel actually has real kitties, so cute! Thanks guys for this amazing experience! I had a great time at Cats in Space, it was such a great environment to be in for the Half Moon Party or any other party you wish to attend. Staff was helpful and kind, the hostel was great to socialise in. Value for money is great. If you are looking for quiet time this is not the place for you, but if you want to be mixed into a great few days of party's then head to Cats in Space. Really friendly staff, good beds, excellent location, nice place to meet new people. Had a great time!